Having not played any previous Battlefield games, I convinced myself to try the demo of this game. In the demo, I found the single player side boring and dull. In my eyes, it was the multiplayer that shined. Now, having completed the single player campaign in the full game, does that opinion change? To be to the point, yes. The single player is a welcome refreshment to shooters today, with its less-than-serious story, and vivid colors. The story itself is very entertaining, but dragged out it feels. There are 7 missions, which seem to me could've felt much more regulated had they been split into 3 more. While the levels are very long, they are also entertaining. The story itself, like I've said, is entertaining and refreshing. Continuing on that, I should refer you to the below advertisement. Yeah, the entire single player campaign is that silly. 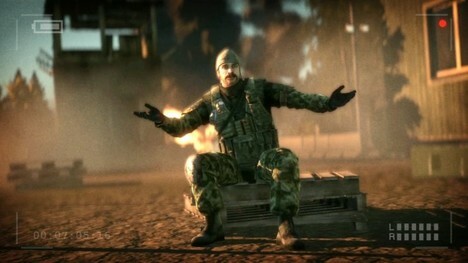 Bad Company makes itself easy though, in one sense; you can respawn. I don't mean like how it is in most shooters where you start off at a checkpoint; any damage you do while you're alive stays done. any guys you kill, all that will stay done. Essentially, it's the Vita Chambers from BioShock all over again. Still a welcome change of pace in my opinion. Multiplayer consists of 25 ranks, 8 maps, and 1 gametype. You read that right; one gametype. At least you don't have to argue over which gametype to play, I guess. This is the one gametype in the game, Gold Rush. Essentially Attack & Defend, but still fun. Try the demo for a taste of the MP. Note: My bias really wants me to give this an 8.5. I love this game, but thats just me.